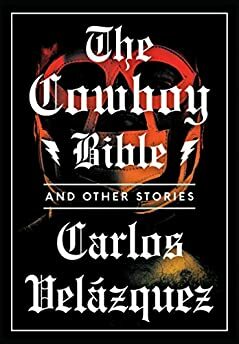 Largehearted Boy: Book Notes - Carlos Velázquez "The Cowboy Bible"
Book Notes - Carlos Velázquez "The Cowboy Bible"
The stories in Carlos Velázquez's collection The Cowboy Bible vividly bring modern northern Mexico to life. "Playful and clever, inventive but familiar, this brief book is deeply satisfying, and warrants multiple readings." The lagunera identity is conceived of very strangely. The region is called "La laguna" (the lake) because the landscape used to be dominated by a group of lakes. Even though it’s common to associate it with the Mayrán Lake, this takes for granted that we are on a lake, which is not true. The unbelievable thing is that a relatively young culture, without roots or traditions, chose a Colombian cumbia as its identity symbol; "Tu lagunero" is in fact the unofficial hymn of the region. This song could be, among other things, an explanation of why the Colombian cumbia music style took hold of these lands and created a postmodern cumbia movement, as it happened in Monterrey with the vallenato. As an answer to this foreign vision, which we appropriated, the most symptomatic group of the cumbia lagunera, Tropicalismo Apache, created its own vision of what it means to be a lagunero. "En la laguna" is as representative of my region’s ontological self as La Sonora Dinamita. I used all of this as the premise with which I wrote the first story in the collection The Cowboy Bible, about an all-in-one luchador, DJ, and art critic. The Cowboy Bible, the whole book, is constructed around the image of the devil. Apart from this, there are many "winks" aimed at certain films, like Pulp Fiction, and also towards books, like Barry Durango's 59 Degrees and Raining. I always loved Romeo Dolorosa’s tone during her speeches. They reminded me of Tom Waits’s sermon in the song, "Way Down in the Hole," a song that speaks of keeping the devil in line. That was the general tone that I sought to place on the book. I have Tom Waits in mind whenever I write. Out of all the Depeche Mode songs, this one in particular sounds like a blues, even more than "Personal Jesus," which was recorded by Johnny Cash with a bluesy feel. I think all of Songs of Faith and Devotion is a blues record, but this tune in particular is because of its spirit. And that is what The Cowboy Bible is all about: getting out on the road. It is also one of my favorite tunes to play whenever I’m behind the wheel. When it was time to think about The Cowboy Bible, I would drive, listen to this song, and come up with stories. (I don’t do this anymore after a crash in which I nearly hurt myself.) There was another record that inspired me alongside this one. It’s Dave Gahan’s Paper Monsters, which had two earth-shattering blues numbers: "Bottle Living" (I got a tattoo of this song) and "Black and Blue Again." Rock is my favorite genre, but during the writing of The Cowboy Bible I listened to a lot of jazz. This piece was behind the title of the story, "Reissue of the Original Facsimile of the Remastered Country Bible’s Back Cover." My intention was to reproduce, in a story, back covers like those on Coltrane and Miles records, which comment on the work. "Autumn Leaves" was my model while I wrote this story. Atom Heart Mother is my favorite Pink Floyd record. It also has my favorite Pink Floyd song: "Fat Old Sun." I listened to the record frequently during the book’s composition, and in my search for new narrative modes that departed from traditional ones, I stumbled upon this song. It served as the base to structure the story "Reissue of the Original Facsimile of the Remastered Country Bible’s Back Cover." The story is divided into three parts: a) Rise and Shine, b) Sunny Side Up, and c) Morning Glory. In fact, these are the same sections in the Pink Floyd song. The song begins with the sounds of someone making breakfast, and while I was hearing this I thought, I want to write a story that conveys these sounds. And that was how "Reissue of the Original Facsimile of the Remastered Country Bible’s Back Cover" was born. But then I asked myself, And what if I also add to the mix a conspiracy, 1968, reality shows, piracy, etc., and the end result is the one we know. The story "Notes for a New Theory for Mastering Hair" was an allegory about guitar players and the people who cut hair. It was my tribute to hairstyling, but the juxtaposition of influences ended up making it a story about rock and the myth of Robert Johnson, which permeates the book. Even at the end I make a parody of the film Crossroads with a reinterpretation of the guitar duel between Ralph Macchio (a supposed white Robert Johnson) and Steve Vai (the devil). This Spanish group was as important to me when it came to writing the book, as were Matando enanos a garrotazos by Alberto Laiseca or Trout Fishing in America by Richard Brautigan. It is responsible, in large part, for much of the humor that permeates the book. "Ellos las prefieren gordas" ("men like them fat") is a play on the "Gentlemen Prefer Blondes" phrase of the Marilyn Monroe film. From the first time I heard this song I knew I had to write a story about it. I love to make fun of a product that, in turn, makes fun of another product. El Viejo Paulino is the Superman of the corrido, the Mexican ballad. Like Julián Garza was Clark Kent, El Viejo Paulino is the Man of Steel; in him we find six decades of northeast Mexican traditional music synthesized, and he inaugurates the postmodern corrido within popular music. He is the protagonist of the story "The Post-Norteño Condition," in which I make fun of Lyotard’s The Postmodern Condition. El Viejo Paulino is also an inexhaustible fountain of humor and derision that splashes on all the stories in the book. El Viejo Paulino is my hero and one of the greatest poets since Quevedo. Salazar is utmost exponent of the Northern bolero, and adaptation for accordion and bajo sexto of the bolero ranchero music style: Javier Solís meets Monterrey. He is my biggest idol in all of norteño music. He prompted me to undermine the machismo within norteño culture in my next story collection. He was a closeted homosexual, and he sung of pain, not because of the indifference of a woman but because of that of a man. Many legends say that beneath his boots—a symbol of machismo par excellence—his nails were painted pink. Decades later, Rob Halford, the singer of Judas Priest, did the same; he sang with machismo but was secretly gay. Above all, what I admire the most about Juan Salazar is his voice. His way of singing, his inflections—and also his style, his clothes, his golden bracelet, his Terlenka wardrobe (which is like Elvis’s country suit). But besides his attributes and his popularity, and the phrase he used repeatedly, "sí, señor" (a war cry similar to "Hey ho, let’s go"), he never left the margins. He was the king of the underground. He is famous for songs that even those born in the ‘60s would recognize, like "Mi último refugio," "El amor de la calle," and "Una imploración." But for me, "Capricho el tuyo" is the one that goes the furthest. Nowadays he has been forgotten, but he was a giant. "Juan Salazar’s Dealer," the last story in my book, ends with Juan Salazar, the ranchero singer, and his reincarnation as a snake, which is in turn reincarnated as a cinto piteado belt in a prison. After I finished writing, I noted that The Cowboy Bible could be a sort of unending loop, reincarnating in different scenarios ad infinitum. So why not have one scenario from a corrido ballad? This is how the book’s first epilogue takes place with Camelia the Texan, one of the first female characters that stars in a narco-corrido. In the second epilogue, the loop jumps on literature and the bible takes on a character from a Juan Rulfo story.